We woke up to a beautiful day on the coast and thought a picnic on the beach with the family would be a great way to spend our last full day of our vacation. 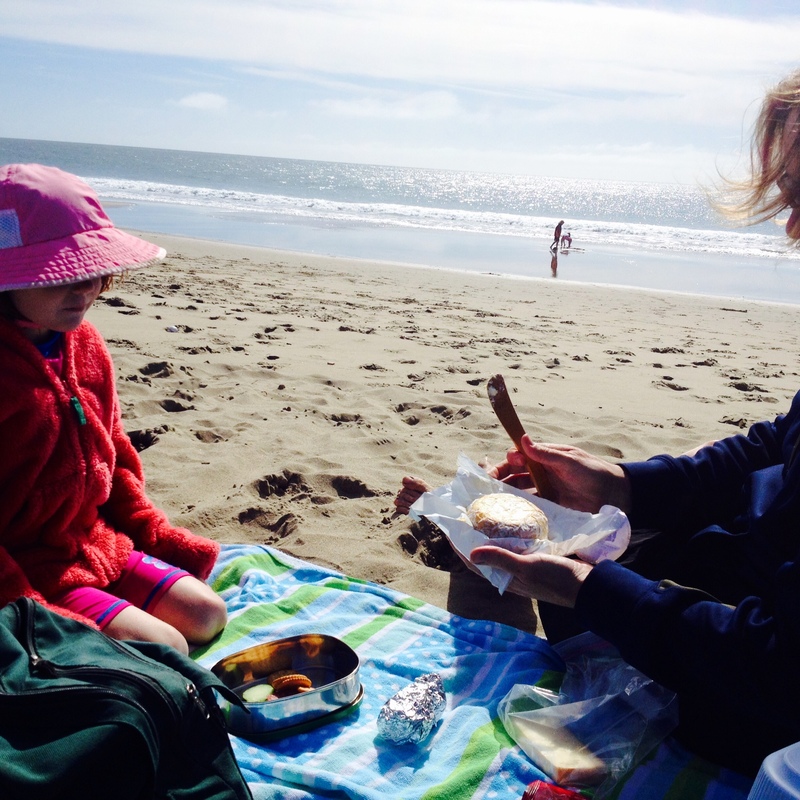 We packed the kids, dog and beach stuff into the truck and headed into town (Point Reyes Station) to peruse the food offerings from the local bakery, cheese shop and other specialty stores. One of my favorite cheese shops to visit in Pt. Reyes Station is the Cow Girl Creamery. In the 1990’s two life long friends found themselves here in Pt. Reyes Station looking for a new food adventure. They began with the idea of Tomales Bay Foods, which was a way for chefs and restaurants to acquire cheese products from local Marin cheese makers. From there they became cheese makers themselves and Cow Girl Creamery was begun here in Pt. 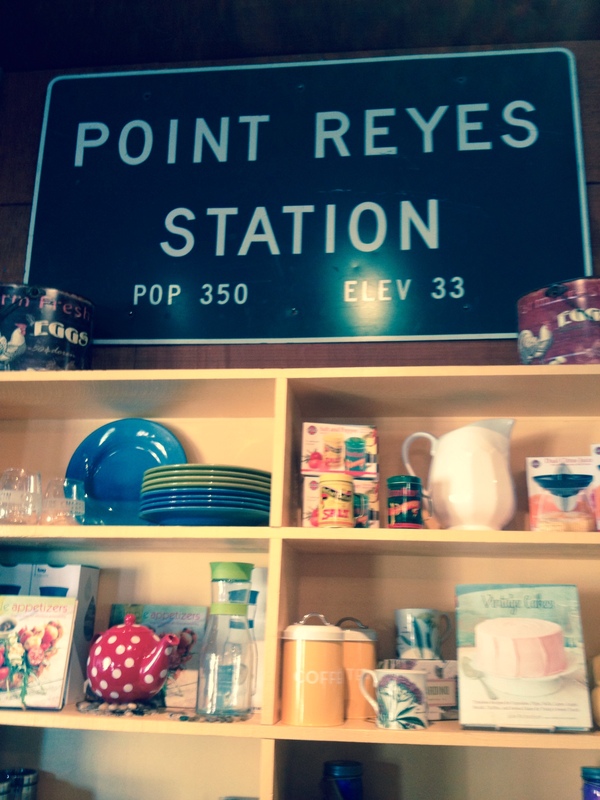 Reyes Station. Since that time their business has grown to other Bay Area locations. Now you do not have to travel to Pt. Reyes Station, Petaluma or the Ferry Building in SF to buy their cheeses. Whole Foods also carries their products. My personal favorite cheese is Red Hawk followed by Mt. Tam which is a little more mild than the Red Hawk. We enjoyed our visit inside the creamery where you will find a cafe, market and many knowledgable cheesemongers ready to help you find the right cheeses to enjoy. After making our purchases in the Tomales Bay Foods, we stopped in at Bovine Bakery and the local grocer followed by my favorite retail store at Toby’s Feed Barn. Toby’s Feed Barn has a little something to offer everyone in the community from a working feed store to a market place, coffee shop, toy store, art gallery, yoga studio and retail shop. They even host the Farmer’s Market seasonally behind their shop next to the community playground and garden. We did not leave empty handed. The kids found mini etch-a-sketches and I chose a lovely market basket to serve as our picnic basket and a local pot of honey. Now it was time to drive to Limantour Beach one of the few beaches in the area that allow dogs to visit it’s shores. The drive is a bit long and though it feels as if you are the only ones out in this beautiful part of the country you quickly realize when you enter the parking lot that many other people know of this beautiful location as well. There is a right and left side to the beach. The left side of the beach allows dogs and the right side does not. Naturally we made our way to the left side from the parking lot. There were lots of families and their four legged friends out today. We found ourselves a spot to put out the picnic while the children played in the water and sand. We stayed all afternoon relaxing on the beach, playing in the sand and water and taking a walk on the lovely shore. The kids enjoyed collecting shells and skipping stones and I enjoyed a little alone time with the hubby. It was a great day to be at the beach and a perfect day to end our visit on. Can’t wait to plan a return visit to West Marin. There is still so much to see and do here!